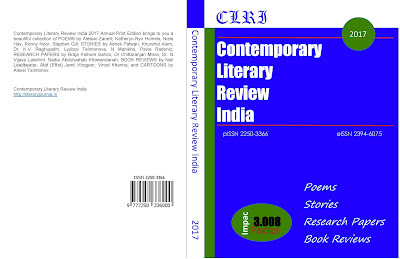 A blog for Contemporary Literary Review India or CLRI. It publishes new announcements, releases, and blurbs meant for CLRI the literary journal hosted on http://literaryjournal.in/. Previously, literary issues were brought out on this blog with own domain. Authors and artists published here can still search their pieces but with http://contemporaryliteraryreview.blogspot.in/. Contemporary Literary Review India 2017 Annual Print Edition brings to you a beautiful collection of POEMS by Alessio Zanelli, Katheryn-Ryn Holmes, Niels Hav, Ronny Noor, Stephen Gill; STORIES by Ashok Patwari, Khurshid Alam, Dr. K.V. Raghupathi, Lyubov Talimonova, N Manikho, Pavle Radonic; RESEARCH PAPERS by Braja Kishore Sahoo, Dr Chittaranjan Misra, Dr. N Vijaya Lakshmi, Nadia Abdulwahab Khawandanah; BOOK REVIEWS by Neil Leadbeater, Afaf (Effat) Jamil Khogeer, Vinod Khanna; and CARTOONS by Alexei Talimonov. Creative Content Media or C C Media is a registered entity that runs a number of literary journals such as Contemporary Literary Review India, CLRI Reviews etc.